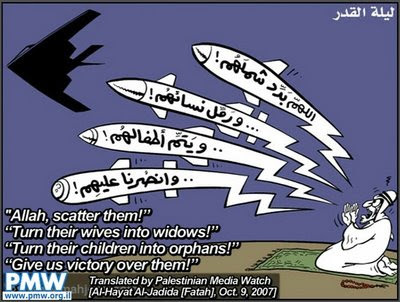 Palestinian Cartoon- "Allah, Kill Americans"
This curse for the death of Americans is a special prayer for Al-Qadr Night (the 27 th day of Ramadan, noted in the corner of the cartoon), when Muslims customarily pray in mosques throughout the night. Jeff Emanuel says it’s an F-117 Stealth Fighter in the cartoon. NOTE: This is the same “moderate faction” that the US is planning on holding peace talks with in November. Palestinian Media Watch also published a report on Palestinian textbooks that is just as shocking. MORE… A Palestinian rights group raps both of the factions.